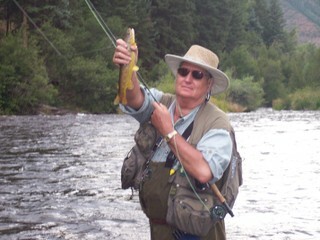 I love to fly fish. 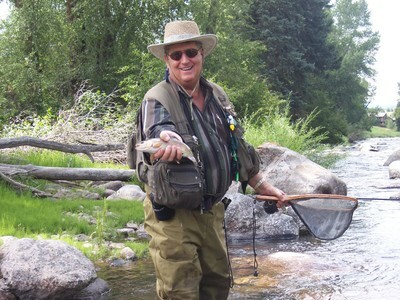 Somehow, and this is really strange, I have avoided fishing the South Platte River. I have fished the Dream Stream portion, but never any of the water above or around Deckers, like Cheeseman Canyon, that so many people I know have fished. I finished up the yard work today and having nothing else to do, the river was calling. I headed south and through Salida to County Road 40. Eventually, and it takes a while, this road comes to a "T" at the South Platte River. The road along the river is marked as South Platte River Road.....imagine that. I fished a few miles south of this intersection and managed to catch a few fish. I caught both of the two largest fish on a flashback pheasant tail. I was dropping that behind a BWO. Most of the fish the rose to my BWO were just nosing it, so I'm quite sure either it was too big or it was the wrong pattern. But, having only a couple of hours to fish, and having already tried a Para Adams, H&L Varient, and Caddis pattern, I wasn't about to make another change. Below are a couple of the larger fish I caught. The brown is around 12 inches and the rainbow 13. Great looking fish, but never as good in a picture. The rainbow was really a nice thick fish. If you are interested in exactly where I caught these fish, email me and I will let you know! Over the weekend I was lucky enough to spend a half day fishing the Eagle River and a full day fishing the Frying Pan River. The fisheries in these two streams appear to be in great shape. As per normal, my fishing buddy Garry (shown below) out fished me, but I did pretty well myself. This dandy 14" rainbow came out of the Frying Pan on Saturday afternoon. We had a really interesting day that required frequent tactic changes and fly changes. At times it felt like we were spending our day tying on flies, however we caught over 30 fish combined. Believe it or not, I used at least 18 different flies! Dry flies used included two Green Drake patterns, three different Caddis patterns, a PMX, a tan Hopper, a PMD, an olive and orange Stimulator, and an Adams. Nymph patterns ruled the day as far as fish caught. I used three different PMD emerger patterns, an RS2, a black midge, a tan WD40, two different drowned Green Drake type patterns (I'm making that up because I don't remember the names, but they were Green Drake patterns), a Prince Nymph, and a red Copper John. What a list of flies! Most often that many changes means I was searching and searching but not catching. This was just one of those days that was in and out of clouds and small hatches came off here and there. I put on the Turkey Caddis about 2:00 p.m. and the browns were coming up and violently grabbing it. It was one of those times fishing that you just live for. Unfortunately, I only had three of them and I went through them in about an hour. Garry had one and he caught one on it immediately and then lost it on the next cast. Be sure to click on this picture to view it full size. That is a vividly colored brown trout. The Eagle fished pretty well and I was fortunate enough to land a very fat and healthy 15" brown. Almost all the action on the Eagle was nymphing. For those of you who know my fly fishing ways, I'm pretty stubborn about using dry flies. Finally, I tired of Garry catching all the fish and I started nymphing. I was almost immediately rewarded with that nice brown I described above. The Frying Pan has private and public water interspersed pretty much all the way from Basalt to Rudi Reservoir. Much of it is pocket water and based on my experience, I recommend nymphing the deep seams with a drowned Green Drake or Prince Nymph or Red Copper John on front and a black midge behind it. The Frying Pan in chalk full of midges so don't ignore this pattern. The black nymph in size 18-22 is a consistent producer. As I mentioned above, the dry fly world was ruled by the Turkey Caddis. I did not see any bug that looked like this coming off, but we did see similar looking tent winged bugs outside our hotel in Basalt the night before. I put it on because nothing else was working and I was immediately and repeatedly rewarded. Even though I saw PMDs coming off the water, I could not catch anything on top using a PMD and did not have a lot of luck nymphing with PMD type emergers. Garry experienced the same problem seeing Green Drakes earlier in the day but not having any luck fishing Green Drake dry patterns. The Eagle fished pretty well. We were fishing very close to Avon. We stopped at Fly Fishing Outfitters in Avon and I have to really give these guys cudos. They were very helpful and attentive and just made an all around effort to make sure we had a good day of fishing. The dry fly fishing was just not happening for us. Nymphing produced fish right from the start. The action was not fast and furious, but we caught enough to keep us interested. 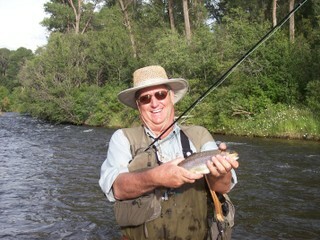 Below is a picture of Garry with a nice Eagle River rainbow. This picture doesn't really do this fish justice. I would say it was a 13" or 14" fish that was really solid.